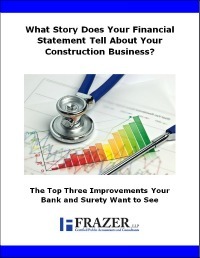 How do you view your company’s financial statements? Are they simply the history of your financial performance, only useful for seeing where your company has been? Or, are they valuable to your company’s future? Though your company’s financial statements present past performance, they are the primary tool your surety and bank use to extend the credit you need to drive your future endeavors. Complete the form at the right and download your complimentary copy today!